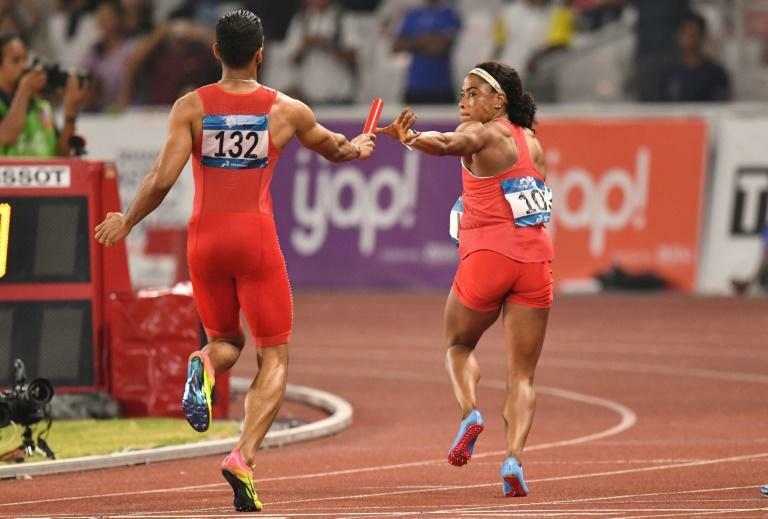 Athletes declared the Asian Games' first-ever mixed 4x400m relay a fun -- if chaotic -- success Tuesday, ahead of its planned introduction at the Tokyo 2020 Olympics. Athletics bosses have introduced the concept -- two men and two women on each team, running in whichever order they choose -- as they seek ways to freshen up the sport, and boost participation. The eight teams in Jakarta tried out a range of combinations and strategies, as a bemused crowd struggled to figure out who was winning. "First you feel like it's difficult because how can you run with girls?" said Abbas Abbas, of gold-winning Bahrain. "But it's very nice especially when you trust your team. "It's the first time I've raced with girls!" The Asian Games race was the format's debut at a major multi-sports event, ahead of scheduled appearances at next year's Doha world championships as well as Tokyo 2020. IOC president Thomas Bach has promised the next Olympic Games will be "more youthful, more urban and include more women". It has been trialled at smaller events including last year's Nitro Series in Melbourne. Ultimately the countries which ran in the order man-woman-woman-man did best in Jakarta, with Bahrain and India pulling clear of the pack early on. "We had two amazing girls. Very fast. Very strong. Like men. We ran with four men!" said Abbas' team-mate Ali Khamis. China's Yang Lei described the event as "chaos" after a gridlock emerged at the final baton handover, while Japan's Eri Utsunomiya -- giggling at the confusion -- said it was "Fun... just fun." Elsewhere at the regional Olympics' fourth night of athletics, Xie Wenjun successfully defended his 110m hurdles gold to stretch China's winning streak in the race to 32 years. Xie, 28, crossed the line in 13.34sec to hand China its ninth consecutive win in the event stretching back to the 1986 Games in Seoul. Xie said he had been given "special instructions" before the race by former Olympic champion and world-record holder Liu Xiang, who is revered as one of China's greatest ever sportsmen. "He's my idol, and it is also an aim to catch up with him. But I'm still on the way," said Xie. In the women's javelin China took a one-two, with Liu Shiying springing an upset on favourite Lyu Huihui, bronze-winner at last year's world championships in London. Liu took gold with a Games record throw of 66.09m. There was also gold for China in the women's 800m, where Wang Chunyu triumphed over two-time defending Asian Games champion Margarita Mukasheva of Kazakhstan. And Li Ling brought up China's ninth athletics gold as she easily defended her pole vault title, clearing 4.60m for a Games record before failing to break her own Asian record with an attempt at 4.71m. But Bahrain secured victory in the women's 5,000m -- courtesy of Kalkidan Befkadu's victory over 10,000m champ Daria Maslova -- to stay in touch with China at the top of the athletics rankings, with eight golds. India picked up their third title of the athletics meet with a one-two in the men's 800m, where Manjit Singh sprung a surprise on compatriot Jinson Johnson.